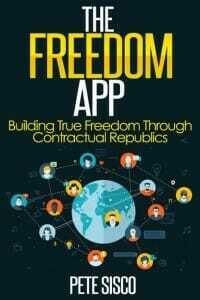 The following quotations are taken from The Freedom App – Building True Freedom Through Contractual Republics. Freedom: The societal condition that exists when every individual has one hundred percent control of his own property. When an individual’s property is taken without consent he or she is not living in Freedom, irrespective of who takes the property and for what purpose. Fortunately every technological tool to build Freedom is at hand right now. …superior, peaceful and voluntary products and methods of property protection will gradually but effectively replace the State mechanism of violence and confiscation as a pathway to Freedom. Most people have no trouble understanding a woman who is forcibly raped “only” five percent of the time is not living in a condition that anyone would call Freedom. Many have more difficulty understanding that a man who has “only” five percent of his annual income forcibly taken from him by a State is also not living in a condition of Freedom. Freedom, as defined, cannot be achieved through coercion. The foundation of our society rests on what is known in economic theory as a ‘moral hazard’. Irresponsible or self-indulgent behavior will always increase in an environment where someone else has to pay the financial price. In a society where there are taxpayers and tax consumers the equilibrium gradually shifts toward favoring the tax consumers. The last guy to touch that hamburger pays all of the taxes it incurred along the way. That last guy is probably you. After two thousand years of democracy that began in Ancient Greece, we still have a social technology that burdens the citizen with confiscation of half of his lifetime production and that forces him to pay for the largesse, irresponsibility, recklessness and fraud of people unknown to him. Two thousand years of virtually stagnant social technology leaves us no better off than an Ancient Athenian citizen and perhaps not far removed from one of his slaves. The African slave in 1813 and the American citizen in 2013 share the common circumstances of living with a legal obligation to perpetually surrender a portion of their production to either a slave-owner or a State and cannot be released from this condition. …as successful as the American experiment is, it has gradually evolved into a system of rule that one could argue is more oppressive than the minuscule taxes and regulation imposed by King George III. Contractual Republics do not employ logical inconsistencies in their operation. They are created to protect all forms of property and they are able to perform their function without attacking the property of anyone inside or outside of the Republic. …politics doth make thieves of us all. The non- contractual seizure of an individual’s property has been codified into our social system in the form of politically created laws. In a Contractual Republic there are no “laws” as we know them today. Zero. In a Contractual Republic, it is not considered whether something is legal or illegal, only whether it is contractual or non-contractual between the parties involved. Even the most fiercely independent among us must come into contact with other people and trade something of value we create, whether physical property or intellectual property, for something of value other people create. This is literally what keeps us alive. These are the stakes inherent in the elimination of coercion: the total abolition of war and an asymptotic approach toward the elimination of crime. This condition of true Freedom and non-coercion can exist, even in a world where no two individuals are the same or have the same beliefs, aspirations or values. In fact, any social system that does not respect those various, and often opposing, conditions is doomed to eventual failure. Some would argue that the routine use of coercion by States, coupled with advancing weapon technology, means almost certain extinction or massive regression for the human species. The Contractual Republic is a peaceful social technology to preserve the species indefinitely in an environment that maximizes human happiness and productivity. In a Contractual Republic there is no moral hazard created by allowing people to plunder others for their own gain. Coercion is friction in the machinery of human Freedom. It is wasted heat and light that could serve a productive purpose but is lost to friction. Our society is founded upon a model of coercion begetting more coercion. Force and fraud of all kinds swirl through our markets, our dealings with each other, our politics, our relations with other countries and every conceivable aspect of our lives. Coercion means unwanted external control of our property. Coercion means non-Freedom. Humankind as a species can never obtain Freedom if it uses social technology that relies upon coercion. Freedom and coercion are mutually incompatible. Freedom cannot be built with socialist ideals of forcing people to share their property. Freedom cannot be built with taxes. Freedom cannot be built with any tool of coercion whatsoever; not in the past, not now, not in the future. Freedom can only be built by universal property protection. The concentration of coercive power in a State always leads to the unwanted control of other people’s lives and property and that is social injustice. Without the barriers of political coercion, the aspirations of individuals and groups of individuals from the full spectrum of humanity can organize and conduct their lives in the precise manner that suits their personal beliefs. 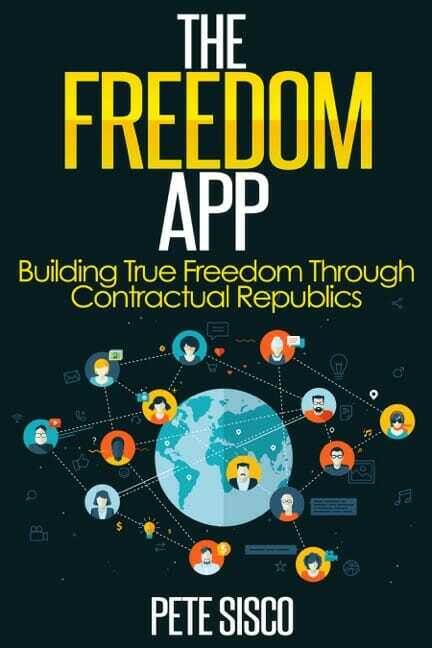 A Contractual Republic is an ecosystem of Freedom and property protection that permits any non-coercive ethos and ideology to thrive to the limits of its own utility. In a Contractual Republic people with deeply held political beliefs regarding the optimum way for humans to live in a political society would be free to live that way without interference from outsiders. There are many divisive issues in our modern culture. With billions of people on earth it is no mystery why so many differing viewpoints exist. A durable social system must have the ability to service divergent and opposing opinions in a way that does not encourage or permit coercive interference with each other. In our current social system people are encouraged to vote in secret to interfere with the property of others. …This is called being a responsible citizen voter. It is in truth naked aggression against innocent parties. There is widespread belief that “somebody has to make the rules”, and historically that “somebody” has been an autocratic, coercive power that told people how they must live and backed up this authority with force. Some people have grown comfortable with that. Some practically worship it. We live in a society where services are provided at the expense of all taxpayers, whether they use them or not, and backed up by coercive force that keeps them in the marketplace exclusively. Competing models, standards and services are not permitted. In a Contractual Republic property is protected, not by military forces destroying lives and property, but by the collective power of every individual’s property not supporting any form of coercion. No one benefits from war except the coercer who prevails and his gain is always offset by orders of magnitude by the losses of other individuals. When those individuals have a say in the matter, as they do in a Contractual Republic, there can be no warfare. In our society the most evil, coercive States are willfully assisted by productive people and companies inside and outside of those States who enjoy no repercussions for aiding in the coercion of innocents. The central problem with our current social system is that State coercion is available to any group that can organize itself adequately to appeal to politicians. The real problem with all religious difference of opinion arises only when someone in the room has a gun and the willingness to force his beliefs on others. Contractual Republics do not operate on coercion, and are engineered to relentlessly diminish coercion, which means any group of religious people can worship as they see fit without fear of being denied their right to do so. Coercive social systems always break down over time. It might take centuries for a Roman Empire, or just a few years for a Third Reich, but a system reliant on force and fraud always requires increasing levels of both until reality completely exposes the lies being told. Many now believe that a total collapse of the Western financial system, and with it the global financial system, is inevitable. It is a practical impossibility to predict whether it will happen in thirty days or thirty years, but the trend is plain and it points to yet another historic collapse on the long list of failed State economies. No leap of faith is required to see the merits in building more protection of property rather than less. In a Contractual Republic coercion is never celebrated, saluted or bowed down to. We live in a society where coercion of our fellow man is built into the fabric of everyday life. Coercion is common because it is so easy and bears no cost to the coercers. People in our society are addicted to interfering with property. In the United States this can take on a military zeal where millions of voters favor invading other countries for the benefit of “American interests” which is simply a euphemism for “financial reasons”. In a Contractual Republic all coercion is bad and every institution and mechanism in society operates to reduce coercion to as close to zero as can be achieved. People are conditioned to believe that some strange alchemy takes place wherein a majority vote transforms an action into something moral. History shows that State coercion always escalates to the point of permeating every aspect of people’s lives. Is there any property or activity today not governed by a coercive law? Once the products, services and institutions of total property protection are operating on a wide scale, Freedom will become indestructible for the first time in human history. Universal peace is created from the cooperation of individuals wanting to live their lives without the threat of force or fraud and with the for-profit competition of enterprises dedicated to the protection of everyone in society. In the absence of the friction of coercion acting on creative individuals, innovation and productivity can flourish. 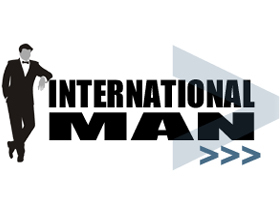 Maximum human Freedom releases maximum human happiness and creativity into a global marketplace. It will only be when all coercion is successfully removed from every society that humankind will be able to experience the full measure of its intellect, creativity and innovation. This is the greatest possible rising tide and it irreversibly lifts everyone to a better life. Everyone makes mistakes in life and some mistakes can be painful. Absent the ability to force other people to bear that pain, every individual is motivated to improve his choices. This is the natural path to individual human improvement. In a Contractual Republic this path is not subverted by any coercive mechanism that foists the mistakes of others onto innocent parties. In an environment of maximum personal responsibility there is no impulse to war. As long as “Freedom” is never defined every State can proudly claim it acts to serve Freedom. Every bomb dropped, every surveillance camera installed, every body cavity searched, every present and future dollar confiscated, every prisoner of conscience confined, every suspect tortured can all be in the service of undefined Freedom. First, of course, we define the word Freedom: the social condition of everyone being in total control of their own property. Once we define Freedom we can see that universal property protection is the path to universal Freedom. And who would oppose such protection? Only those people wanting to benefit from plundering others! The vast majority of us are decent people who are happy to participate in the protection of property except for one giant problem: there is no mechanism in society to systematically protect all forms of property. In fact, there is a ubiquitous political mechanism designed to do the exact opposite — plunder property. The people of the world create all of the intellectual and physical property and they hold the totality of the net worth of the planet. In a Contractual Republic no one is big enough to successfully coerce another since the individual people in the marketplace have property that dwarfs any single person or company. In Contractual Republics coercion is not possible and thus war cannot exist and crime is diminished to the limits of human possibility. This is a condition of world peace. Freedom is a product that has never existed. Freedom is a universal property protection mechanism that supplants coercion. Those of us alive today have the opportunity to be the greatest generation to have ever lived. This can be the generation that created global, indestructible and enduring world peace and Freedom for all posterity. The creation of global human Freedom is, by definition, a wholly peaceful revolution that does not require firing a shot. No dictator must be overthrown, no permission need be asked. Opposing the State is a waste of time, money and lives and is always met with guns and bloodshed. The task is to build something better. The Wright Brothers did not spend their efforts sinking ships and derailing trains. They simply and peacefully built something superior and let the market decide its preference. Every day in dozens of ways we are forced to participate in the theft of property from innocent people with no more ability to escape the coercive State than the African slaves of 1850 had to escape their social system. Worse, we help perpetuate coercion as a means of governing humanity. Freedom is not an ideology to be fought for. Freedom is a technological product that protects all forms of property and displaces coercion. Freedom is a universal concept, just as geometry is. Freedom ensures the continuity of human life and the property created by human life. Coercion is opposition to life. [O]ur species is yet to innovate and construct a durable social structure that ensures the stability to live and plan on a long-term basis without the probability of widespread loss of life and property though coercion. We have invented language, mathematics and science, but we have not yet invented Freedom. Freedom is a requirement for the indefinite life expectancy of an advanced sentient species. Absent the technology of universal property protection but with advanced scientific technology, our species can end without warning from nuclear or biologic warfare, to name only two risks. The creation of Freedom — universal property protection — is the single greatest advancement waiting to be built by humankind. By definition, it will have the richest and most glorious legacy. Once durable peace has been built it unlocks the full wellspring of human creativity, benevolence and innovation. It not only allows escape from the shared inhumanity of participating in immoral coercion, it facilitates the munificence of having every action we take benefit everyone in the world in some small or great measure. Freedom is not something to “fight for” any more than you can fight for the creation of a light bulb or a space station. Soldiers don’t build Freedom and they don’t fight for it. Soldiers kill people for one State and their victims die for another State. None of the players in that game lives in a condition of Freedom. To build Freedom we must become disenthralled with using coercion. Now the final step in the great revolution of freeing humankind from coercion is to recognize that “We don’t need a State.” As individuals we can organize ourselves, by mutual contract, into thousands of peaceful, productive societies that mutually support the principle of property protection and non-coercion. Universal property protection is the gift of survival of the species and the ability for every person born in the future to exercise his or her life with Freedom to live and create to the fullest of his intellectual and artistic ability.